You can post your Columbia City photos to the Citizens' gallery by joining our group on flickr.com, a free photo-sharing service. Flickr is a photo-sharing service owned by Yahoo. If you've already got a Yahoo account (for Yahoogroups, MyYahoo, etc), you can use that. Otherwise you can create a new logon. Load images to your flickr account. This is your own collection — not yet part of the group. 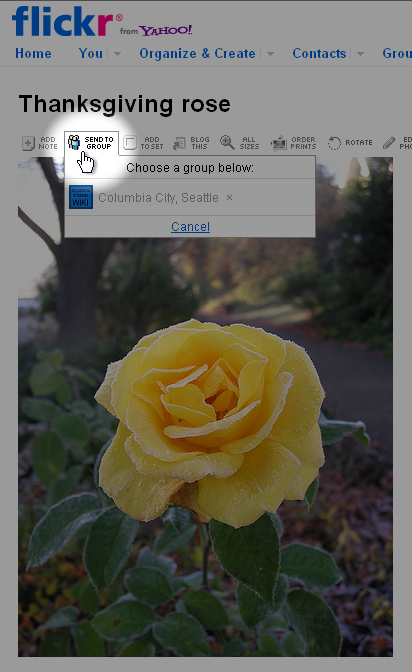 You can edit images, title them, organize them into sets, even locate them on a map. You can add as many as 15 photos to the group per week. Thanks for sharing your images! Generally, your image automatically shows up in the group pool. My photos are in the flickr pool, but they haven't shown up on the wiki. Why? We've seen a couple reasons for this. 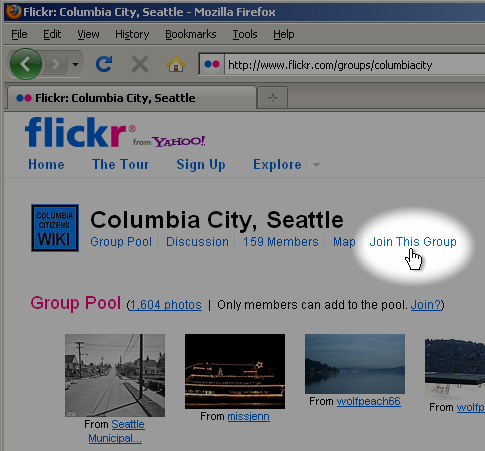 Any images posted to the group from brand-new flickr accounts won't show up on our site for at least a few days. That's a flickr policy, apparently. If your image's privacy setting isn't marked "public", our site can't show it. You can adjust that setting under "additional information" at the bottom right of the image's flickr page. Here's more info about that from flickr. How will neighbors see my photos? Thumbnails of recent images appear all over our site — in the sidebar, at the top of the Citizens' gallery, and in this week's draft Wikli. It sometimes takes a little while for our feeds to update. Thumbnail images link through to your original image, hosted by flickr. Sometimes we'll use a larger-format version of your image to illustrate a page. When that happens, we should credit the photo in a caption.